The execution and dedicated practice of bunting can take any good offensive team to the level of a great offensive team. Understanding and practicing the bunting philosophy explained here will allow players to be a part of their team’s offense moving from good to great. No baseball team is complete in the offensive phase of baseball without mastering the art of bunting. A team’s ability to bunt provides an exceptional counterbalance for any team built on scoring runs through brute force and power. Many football pundits believe a gridiron team must choose to be great at the run or the pass, but not enough time is available to be great at both. Time is proving the opposite - being an exceptionally-balanced offense provides the kick necessary to become great. The same principle holds true for a baseball offense. A team must be able to bunt and move players around the bases with both precision bunting and power. 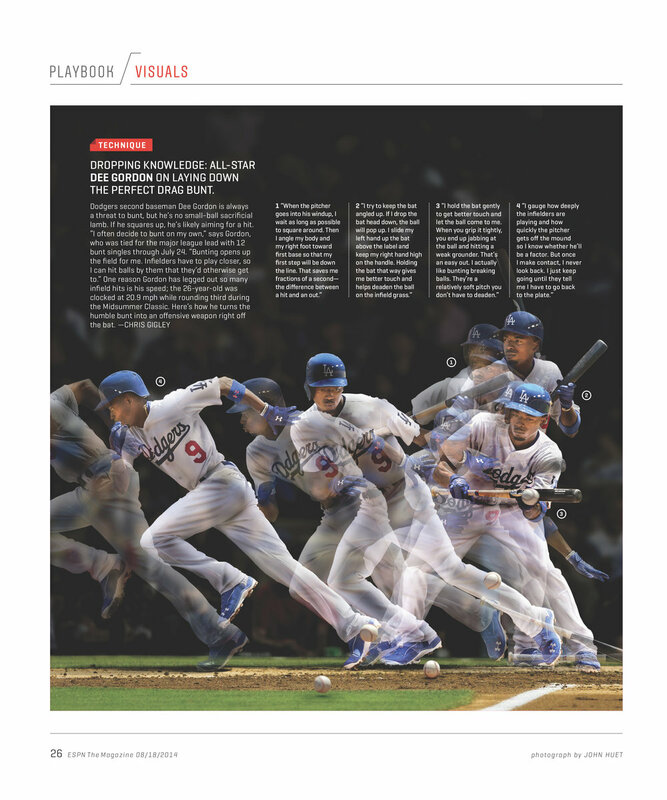 See the ball by making sure both eyes have a clear line of sight to the baseball. Open the shoulders to the ball, this creates a good line of sight and the ability to react. The barrel of the bat should come through the slot of the shoulder, setting the bat at the highest point of the strike zone. Hitters never want to lift their hands to adjust to a pitch due to the potential of pop-ups. The hands should be in front of the plate. The top hand should “pinch” or “cradle” the barrel, both for control and the safety of the hand. The bottom hand should be at or close to the knob of the bat, acting as a rudder. The elbow of the arm connected to the bottom hand creates an upward angle in a relaxed fashion which serves to deaden the baseball upon impact. The angle of the bat must be set appropriately as well. The bat should be set with the barrel slightly above the knob to create a slight upward angle. In addition, the angle of the bat should also dictate the direction of the bunt. The barrel should point between the SS and 3B for a bunt down the third-base line, and should point between the 2B and 1B for a bunt down the first-base line. Players should be encouraged early in learning the bunt to never set the angle directly at the pitcher. These angles should be set as early as possible for the desired bunt. The knees work similarly to the hitting fundamentals. The front knee opens with the front foot and creates an almost 90-degree angle. This provides the body movement to go down with the height of the pitch. For the same purpose, the back leg is in a position in which it can collapse and deaden to provide the appropriate depth. A pitch high in the zone does not require that depth so the back leg provides strength. The feet should creep close to the front of the batter’s box. This allows the player to use the whole 90 degrees available to him on the field. Drills: there are a pair of drills that can work independently or combined together. Players can learn bunting technique by using the one-hand bunt drill. Players hold the bat with their top hand, set the appropriate angle, and drop bunts with one hand. The pitcher should be closer and throw the ball softer than usual as this skill is mastered. In addition, players can learn the skill of bunting by bunting from their knees. Using both hands or one hand, players should use the technique described above with their knees and execute bunts from on their knees. There are a number of different kinds of bunts for different situations: the sacrifice, squeeze, drag, push, and slug bunts. Each kind of bunt has its own set of nuances but there are principles that govern all. The first principle is to always bunt first and then run. Trying to run before performing the action of the bunt will result in failure more often than not. The second principle is to bunt strikes and take balls. The final principle is to bunt the first strike every time. The opportunity to get the bunt down at the right time is paramount. Abiding by these principles will allow any type of bunt to be successful. The sacrifice bunt requires a willingness to give up your at bat for the good of the offense, the good of the team. The hitter should cheat up in the batter’s box, as close to the front as possible, in order to get better plate coverage and to take advantage of the full 90 degrees of the base angles. The timing of the sacrifice bunt is a matter of coach’s discretion. Some coaches desire their players to show very early, even as the pitcher gets into his set position. Some coaches prefer to eliminate the surprise element altogether daring the defense to take the risk of getting the force out, hoping to force a mistake by the defense. Virtually all pro teams and most college teams don’t show until after the pitcher comes to the set position, lifts his leg and breaks his hands. No matter the timing, bunting before running, bunting strikes, and bunting the first strike are the most important elements in executing the sacrifice bunt. The following movie is an instructional piece highlighting the techniques of the sacrifice bunt. The squeeze bunt is an aggressive, high-percentage play that occurs when a player bunts with a runner on third base. There are two kinds of squeeze bunts - the typical squeeze bunt play and the safety squeeze bunt play. The difference between the two plays exists in the timing. The typical squeeze play requires the runner and hitter to act when the stride foot of the pitcher hits the dirt. The runner breaks for home and the hitter squares to bunt right as the pitcher’s foot touches the ground. It is essential for the hitter to get the bunt down in order to protect and score the runner. The safety squeeze play is a drag or a push bunt from the hitter while the runner reads the downward angle of the bunt before breaking after an great secondary lead. Both plays, when executed properly, provide runs for the offense and serve to demoralize the defense. In the case of the video, Oregon uses the typical squeeze bunt to win a game late in the PAC-12 conference tournament in 2013. The drag bunt, for both right-handed and left-handed hitters, is one that is often hurried and poorly executed. The common misunderstanding about the drag bunt is that it must be executed in a hurry and with total surprise. In fact, minimizing the movement by the hitter, using the same techniques as the sacrifice bunt, and finding the right opportunity allows the drag bunt to be successful. The hitter should move to the front edge of the plate and square with similar timing as the squeeze bunt - when the pitcher reaches foot strike with his front foot. However, timing is less important than placement of the bunt. Looking to bunt against a corner who is playing back (third baseman for the right-handed hitter, first baseman for the left-handed hitter) and placing the ball up that line will make the drag bunt successful. This is one bunt situation where being perfect or being foul are both acceptable. As with the sacrifice bunt, here is a video explaining the drag bunt. The push bunt, executed by right-handed hitters to the first-base side of the field, causes potential confusion for the defense. The push bunt should be placed in an area that causes just a moment of uncertainty for the defense. It should be in a place that forces the pitcher, first baseman, and the second baseman a moment to decide who is fielding the ball and who is covering first base. A well-placed bunt and a hustling runner can beat a play at first base this way. A push bunt in a first-and-third situation, or any situation where the first baseman is holding a runner, can cause problems like the one in the movie below. The slug bunt is like the push bunt for the left-handed hitter but requires a specific situation. The hitter would square to bunt early and as the third baseman charges to field the bunt, the hitter bunts the ball in between the third baseman and the pitcher, in the direction of the shortstop. This results in an easy single yet takes a tremendous amount of skill to execute. One perception of great bunting teams is that they posses excellent speed. Nothing could be further from the truth. While speed helps the bunting game, great technique trumps speed and allows any team to be a good bunting team. The individual player must understand his own gifts and limitations in order to execute bunts well. A bigger, slower player will need to pick his spots appropriately (i.e. - bunting with corners deep) and bunt the ball farther up the line to create longer plays necessary to rumble up the line. Faster players need to refine their bunting game to bunt in smaller spaces. Either way, bunting at the high school and college levels are an important element of any successful, balanced offense. Obviously getting the bunt down triggers the next component of that offensive play - base running. While base running is addressed at length in a separate chapter, addressing leads and reads on bunt plays is helpful. When getting the lead in an attempt to advance from first to second base on a bunt play, the runner should get a normal primary lead but a more aggressive secondary (post-pitch) lead. The runner should seek to play fast and aggressive, but not silly. A faster, harder shuffle towards second in anticipation of the bunt getting down and then back to first base if the bunt doesn’t get down creates the appropriate level of aggressiveness from first to second base. The same holds true from second to third base, but the runner should be more aware of pick lays at second base as most teams run most of their bunt picks to second base. This should not halt the fast and aggressive play but should make the runner more aware. From third base to home, the runner should plan to extend by one more full taking a bigger, but not obviously bigger, lead to gain ground on home plate. Excellent base running makes an excellent complement to a well-executed bunt. Practicing bunting and keeping the skill set sharp is worth a daily effort. Keeping the skill fresh and presenting new competitions is important if a team does work on bunting every day. While keeping the bunting skill on the practice plan consistently is important, showing it is important by the coaches being present is also vital. Monitoring progress, and providing energy and motivation will keep the players on their toes during this, and every, section of practice. Hitters bunt the first and last pitches during batting practice rounds. Use cones to designate where hitters should bunt the ball, either as a spot or as an alley. Establish groups of three and rotate through these roles: bunter, thrower, and shagger. Determine what kind of bunt(s) the players should execute and send the players up an outfield line. This works as a simple, daily element of practice. Make sure the players are throwing the ball hard enough from 45-50 feet to make it realistic. In scrimmages, make sure everyone is asked to bunt. Making sure all players in the program are able and willing to bunt is vital to the team’s success. It’s important to winning baseball. Bunting in game-like situations is vital to the skill’s development. Concentrate on bunting, a finer skill, as you head into a weekend series, tournament, or important game. On larger teams, like high school or college programs, take 16 hitters into two groups of eight each. In 20 minute segments, one group works batting practice on the field while the other works in the cages. Then they flip flop. All of the hitters would work on sacrifice, drag and push bunts in both the field and cage setting and strive to be mechanically. Bunting in both places shows the hitters the importance of bunting.